There is a listing on eBay that list the Diecast Masters International HX520 with lowboy, jeep and stinger as a pre-order. 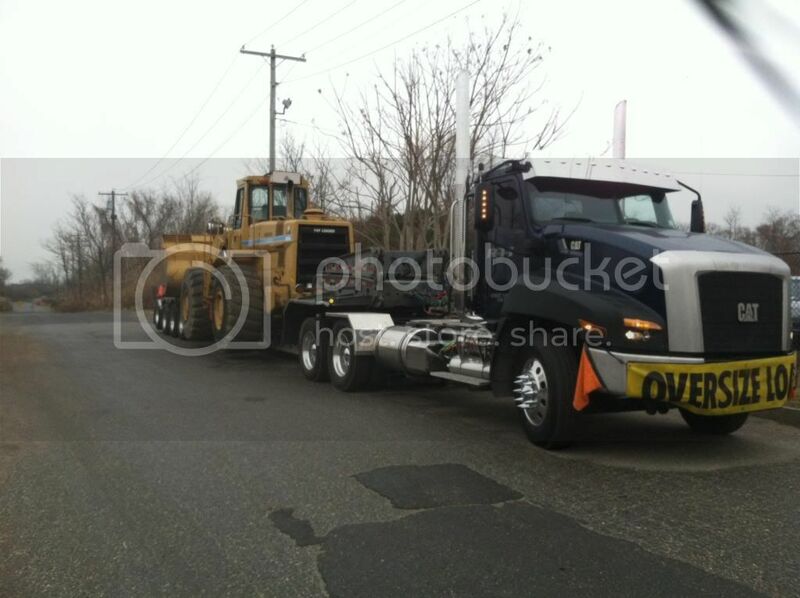 Is that a fact, is the lowboy really going to be coming with a jeep and the stingers? Does anybody know when? 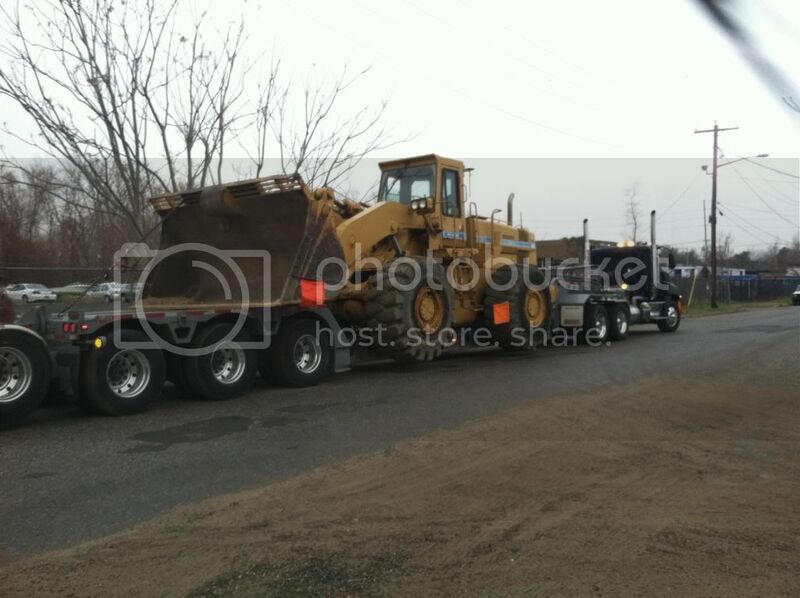 Might be interested in that lowboy setup minus the truck. Yes - this is a special edition of the model. You can pre-order this version using part number 71019 on our website! But the model is coming in RED! Just pre ordered white and red plus 3 axle tractors. Anybody besides me think it's a little cheesy that a multi axle lowboy doesn't have functioning outriggers and planks? Oh well, not the worst thing, I guess. I have one in black and it is a fine model. Agree on the outriggers, interesting that the photo for the one with the jeep seems to have outriggers and extension boards. And a question for the heavy haul experts out there; the trailer has a gooseneck extension which works well with the triple axle tractor. The jeep appears to have a "standard" length gooseneck. Would a jeep not be used with a triple axle tractor? 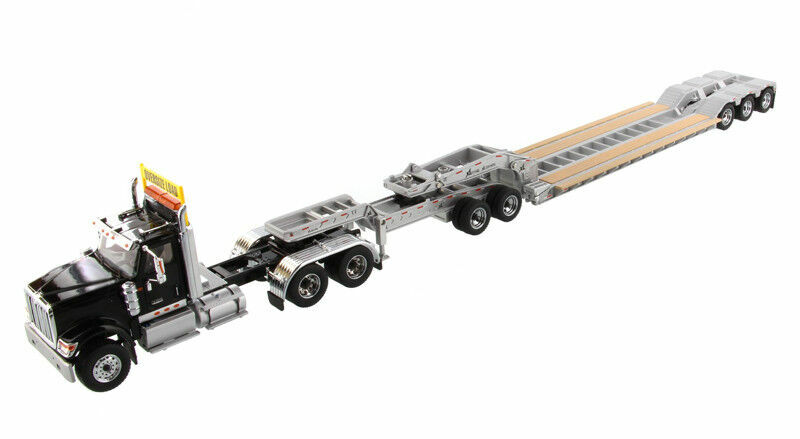 Also, any idea what the load carrying capability would be for the triple tractor, trailer and 2 axle stinger? Rob as soon as Ken gets on the air waves you will have a load on that model and will be ready to roll with confidence. For model posing purposes you can figure about 20k per axle so on a 4x2x3x2 that would be 220k gross. With a tare in the 80-85k range that leaves about 135-140k for your load. The problem is that the set up as modeled will not distribute the weight evenly so your actual legal weight will be lower. The gooseneck extension is not long enough to get enough weight forward on the jeep to get the truck drive axles up to weight without overloading the axles on the jeep. The 5th wheel on the truck isn't far enough forward to get your weight on your steer axle. In reality the net would probably be under 120k. Good explanation, makes sense. Thanks Clifton! Clifton hit it on the head! The short neck extension is for a tri - drive tractor. You have to have the trailer neck extension up tight against the jeep neck to get enough weight on the tractor. On the tri-drive tractor without the jeep, the fifth wheel pin needs to be in line the back section of the tire of the first wheel closest to the cab, or closer forward to the cab to get the weight up on the front axle. Around the Lake Michigan states where you can get 25,000 lbs or more on an axle the third axle on the tractor can be utilized, still a chance of overloading the jeep. Always looked good on paper for a permit if you were't crossing a scale! HaHa. Allpwed weight: 20,000 - 75,000 - 50,000, - 100,000. Awesome, thanks Ken! And it's a direct hit as I am in one of those Lake Michigan states! 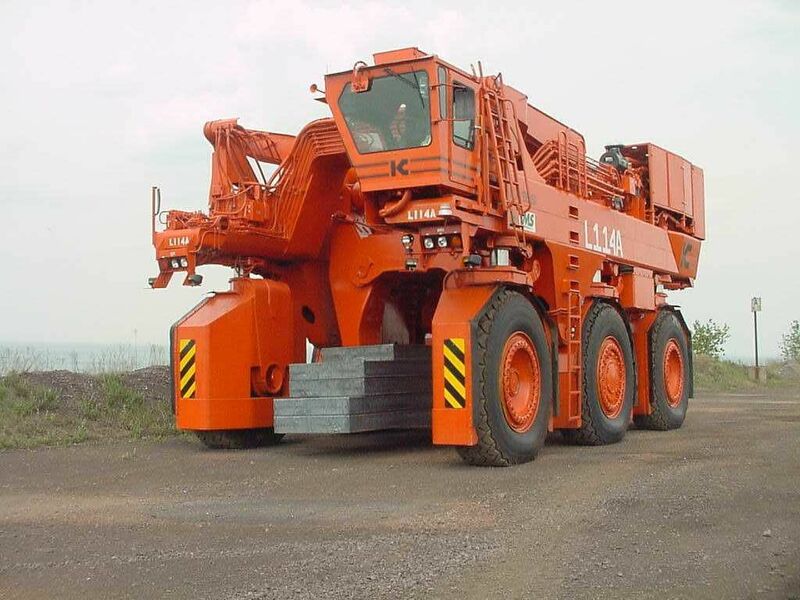 Ultimately, I'm looking to haul my MLC650 rotating bed assembly in full dress at 157,900 lbs per Manitowoc. I haven't looked recently but I suspect removing the live mast, boom hoist, and gantry on the model is no easy task! Rob, you would need a 3+3+3 trailer with a 4 axle tractor in the real world for that load. You could carry 130,000 - 140,000 on the IH set up in MI. In the model world, anything goes! It works in my world. Claus what set up are the slab carriers transported on, and do they have to be broken down for transport? I also see you are a fan of the 560B’s that was one of the first models I purchased. Going thru college I worked for a developer who had one and spent a lot of time greasing it, he used to let me play around on it a little bit it was a good size loader. Do you have the First Gear 1/25 560 Pay Loader that is a great model. I have it on a 1/25 Husky 3 axle lowbed that Quinella has loaned to me, I have the International S series tractor under it and it looks great on it. I have spent a lot of hours in the cab of a 560B or 560 Payloader. All mechanical, 855 Cummins last forever(the early straight 560 had the International and were dogs in comparison to the later ones with the Cummins). Kress Slabhaulers are huge and take more than a load to haul. They weigh 150 Tons and haul an additional 150 Tons. These two pics show two different generations of Kress Slabhaulers but both are basically the same dimensions. They have to all fit through the same size doors in the mill so there is not a lot of room to change the dimensions on the machines. No, no 1/25 in my collection. Just want to say none of these are my pics. Also Steve, talking about those old Payloaders brought up some bad memories of loading salt trucks in the winter in Chicago, 60 trucks lined up bumper to bumper in the morning, most of the drivers not speaking English. Yard boss being a jerk, don't miss those days! Claus thanks for the information on the slab haulers, those are huge. What is the useful lifetime on those machines, they look extremely expensive. Keen Transportation must have an unlimited budget for rubber, that is one long set up. How far is it from the Kress factory to the steel mill. Kress is in Peoria Illinois but those slab haulers are in mills all over the country, Canada and I'm sure elsewhere. As for the lifetime the place I work at uses everything till there simply is no life left! They have a couple machines that were built in the early 90's which doesn't sound all that old till you think about a 24/7 job, hauling their maximum capacity bouncing up and down slag roads.